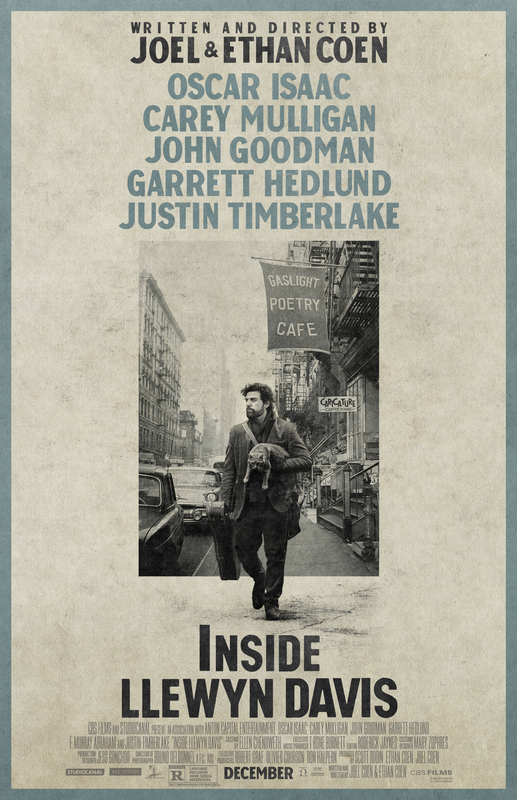 Inside Llewyn Davis inhabits a cold, blustery, 1960s Greenwich Village. On the fringe of the new folk movement, directionless singer-songwriter Llewyn Davis (Oscar Isaac) drifts between the loss of his writing partner and the hope that he can make it on his own. The introduction of conflict through a one-night stand (Carey Mulligan) and its accidental consequences, and the adoption of a friend’s cat suggest that Llewyn’s life could change if he’ll let it. Inside Llewyn Davis, written and directed by Joel and Ethan Coen, is a story that never quite resolves. This is a film about loose ends and unresolved potential, set in a cold, indifferent world. The open-ended nature of the final scene leaves viewers with the contradictory notions of promise and failure. The life of Llewyn Davis is one of uncertainty and Davis is buffeted by homelessness, lack of money, and the question of whether or not he’s any good. This is a sombre film and one that smacks of sadness and cold realism. For every successful songwriter that has survived the test of time, there are hundreds who failed. Not because they were worse than their contemporaries but simply because their opportunity never arrived. Where Llewyn Davis sits in that hierarchy is what the film sets out to define. If viewers are looking for a simple, clear-cut tale of redemption, then Inside Llewyn Davis will disappoint. The elliptical nature of the narrative means that this film never fulfills any sort of genre expectation. Instead the film reflects the journey of the protagonist and the heartfelt plucking and strumming of Davis’s folk performances never quite receive the acclaim it deserves. (Inside Llewyn Davis was snubbed at the Oscars). There are a number of great scenes in this movie; from the opening, tightly framed rendition of Hang Me to the not-quite-good enough performance for a label executive, but there is one scene that stands out and it cuts straight to the core of the movie. Llewyn Davis is struggling for money and so he agrees to a session guitarist role with novelty group, the John Glenn Singers. They perform a goofy pop song, “Please Mr Kennedy.” Unlike Llewyn’s brooding folk output, this song is catchy and sellable and the hook, “I don’t want to go to outer space” reflects Llewyn’s fear of the future and perhaps more accurately, change. America is headed towards the stars but Llewyn would prefer to remain in the past. Llewyn Davis isn’t a good guy. He’s dismissive and Oscar Isaac conveys this disdain through droopy-eyed sneers. Llewyn is ultimately unlikeable but that’s not to say un-relatable. However his attempts to get money together for an abortion are unpleasant and at times downright morally questionable. But viewers should remember that Llewyn is a tortured soul, all alone in the big bad world and his musical career is in tatters after his song-writing partner jumped off a bridge. The world is conspiring against him. But is that really accurate? The Coen brothers leave that decision to the viewer. Llewyn is a good musician and the songs he sings often hit home. But it’s his inability to socialise and get on with his friends that let him down. A taught dinner scene later in the film highlights this anti social egotistical streak. Perhaps the point of Inside Llewyn Davis is that no one can make it alone. We need help at times, even if it’s just a sofa to crash on for a night. Llewyn Davis is a good musician and he often plays from his heart. But his arrogance serves to distance him from everyone else and its hard not to finish the film with the feeling that he was never quite good enough. That’s not true of the film itself however and Inside Llewyn Davis is a charming snap shot of life in Greenwich Village in the sixties. Look out for the performer who upstages Llewyn at the end. It’s a moment that hits hard and leaves viewers with the melancholic understanding of Llewyn Davis’s place in the sixties folk scene. Inside Llewyn Davis is a gentle and wistful film, and its heartfelt, and ultimately timeless story is that of a man striving for more (and failing.) Its in that failure that the film finds sadness and bitterness, but, and this is its great strength, through the striving it also manages to find humour and even great tenderness. Pingback: 13 Top Musical Performances in Non-Musical Films | Andy Mckendry.